Making good quality content is hard work with sometimes hours invested in writing, formatting and choosing images for the article. To make the most of all your effort for the longest time it is recommended it is regularly updated. Content can become old very quickly but there are a number of solutions. Old content can be refreshed and drive traffic once again to your website. If checking Google Search Console / Google Analytics shows the article CTR is really low then review the article title and description. Rework poorly written content, make it better and improve readability. Prioritize the articles that are low and update the content with the most potential. Update the information so it is correct. If new information is now at hand make sure it is added. All text then add some color with images or better yet, video. Maybe it reach the expected audience the first time it was published, ask yourself why and what can be improved this time. Reevaluate your content, update it and market it again. Good content is good content, republishing good content means a whole new group of people may have the opportunity to read it. Yes, there have been studies and it works. Vox’s evergreen project is impressive. 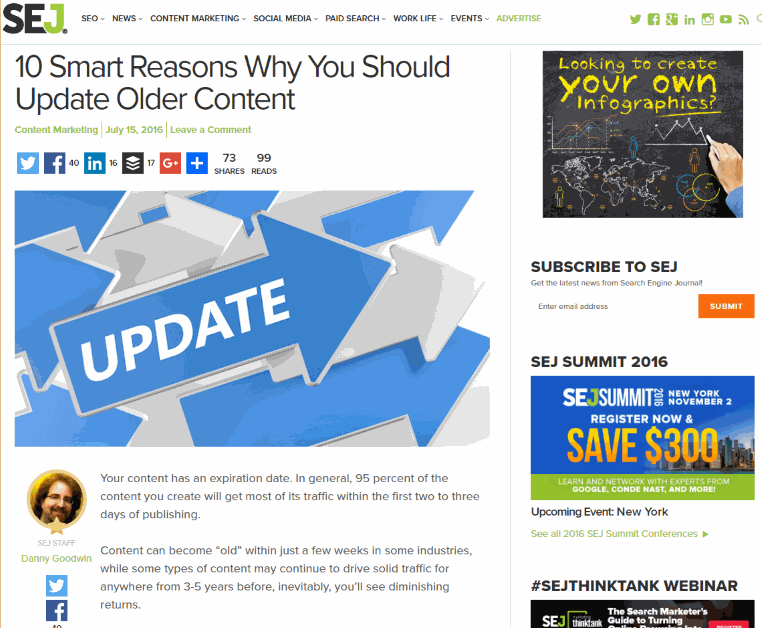 Full article 10 Smart Reasons Why You Should Update Older Content by Danny Goodwin can be found on Search Engine Journal. Finished updating your old content, do not forget to also review your internal linking possibilities with The Ultimate Internal Linking Cheat Sheet to Boost Your SEO. Article summary by Paul Woods of Portagemma. Portagemma provides professional secure WordPress web hosting and design services.